Waiting for the next Wave! Truth is, I had to give up surfing. Much to my chagrin, I had gotten to a place where the pain in my “old” shoulders (competitive swimming and surfing for years) took its toll. I hated to admit it to my old surf pals, (Kevin especially) that I had moved on to a boogie board because I could by-pass the swimming motions and lean on the strength of my legs only – at least I could still enjoy the waves. (Ed. Comment – if I make it over to Hawaii again, I am going to pump myself full of Advil and go for it nonetheless). I was never the surfer my pal Kevin is…but I still had fun. I loved the water…the smell of the sea air…the thrill of a coming set of waves…and of course, the rides were worth the entire effort. 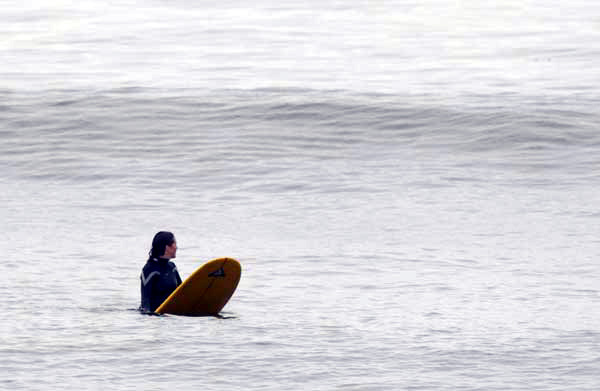 The one thing I never did care for though in the surfing years was the waiting. Some days, the sets would be few and far between…so I’d just bob there in the water…me and my HORRIBLE eyesight (double visioned-near sighted-astigmatismed dude that I am). I couldn’t see very far out into the distance…in fact, I usually had to rely on guys near me….when they started to paddle because a set was incoming, I’d join the party. Come to think of it, the waiting issue was as much of a problem with not being able to see out to the next set as it was the waiting in and of itself. Waiting…I’m not that good at it. I like to see things coming…I like to see the next challenge, the upcoming deadline, the next new adventure, the next big move on the horizon…to not see those things brings me face to face with my vulnerability and the fact that I am not in control. I hate that! I struggle with not buying something when I want it now…I get distressed when I’m waiting for a flight and the note on the board at the gates says “delayed”…I am not good at waiting for God to open the next door. I just “know” that the next “set” (the new Kingdom opportunity) is right outside of my vision…I’m straining to see it…but I can’t get my eyes on it…I know the next “wave” is going to be full of excitement, challenge and blessing but I’m just not in control of when it is going to arrive with that opportunity for me to “enjoy the ride”. Apekdechomai, a triple compound word made up of two prepositions, apo, “from,” and ek, “out,” and the verb dechomai, “receive, accept.” It means “to await, expect eagerly.” (by the way, it is the word we get “appendectomy” from…interesting! That’s why waiting is something that gets us in the gutt! Maybe that is a good word picture of what some might call, better yet, what we might the agony of waiting. I’ve been spending some extra time this week reading over the sections of scripture that speak specifically to waiting…there are many Psalms (prayers and pleadings) that deal with waiting…as well as prophetic stories/experiences of looking for God’s deliverance and will to be realized and revealed…there are stories of waiting from the story of Job to that of Ruth (to mention just two) and there are challenges to wait upon God that permeate just about every major section of the bible. You would think I would “get it”…I’ve walked this path before…trustworthy, faithful, good, dependable…these are all characteristics of the nature of the God we love and serve. Yet, the lessons of waiting keep coming…why? Because it is so easy to slid back into that disturbing and delusional belief that we are actually in control and that it is God’s business to NOT make us wait. Truthfully – as I’ve read the verses and scanned the sections, I like the OT images utilizing the word, “qavah” (especially Psalm 25, Isaiah 8, multiple occasions in Jeremiah)…I need my heart “twisted” around the loving and powerful nature of my God…I need to rely on the strength that the Spirit gives as the Spirit illumines and leads…I need to trust in the strength that the newly formed cord of “waiting” can bring (my dependence upon God paired with His faithfulness and trustworthiness). Waiting gives birth to “holy expectation”, that is, waiting WITH the reality that permeates the soul that we can have certainty and a transformational reliance on the coming “deliverance” from the Lord. That is why I am willing to wait…for something to be born in me that can only come from the Lord. Anything else, would not give God the opportunity to reveal and prove His trustworthiness and faithfulness to me again…and trust me, I need that gift! Don’t you?